This is a really hard one. It’s not that there aren’t books out there, there are many, it’s just there can be so many different reasons why some children don’t enjoy reading. It’s associated with school, they don’t see their parents doing it, there’s loads of other stuff to do, it’s a nice day outside, they’re knackered etc etc. Somehow we need to remove the work/chore aspect and convince them about how amazing it can be, how it can take them to incredible places and so on. When I’m talking to schools about reading I always talk about how visual writing is. How reading a book is a bit like going to the cinema; you read the words and your brain turns those words into images. You can’t help it. I write the words ‘purple elephant’, everyone automatically ‘sees’ a purple elephant and so on. Sometimes children get it, othertimes they look blank, or have a ‘really?’ expression. Anyway, I firmly believe it’s true. We think in images, not streams of words. The words are there to help us ‘visualise’ the text. It may also help that I’ve read so many books over the years that reading is utterly second nature and I really do ‘see’ books rather than read them. I think therefore that there are any number of keys to reading – plenty of pictures, humour, excitement and interesting/relevant subject matter. Football? Guns? go for it. 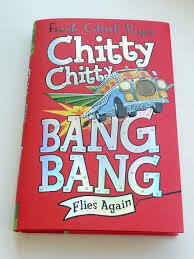 There are plenty of excellent books out there (Tom Palmer has written loads) which are exciting, and about something football mad boys can recognise. It sounds obvious, but reading about something like quantum physics isn’t that interesting, unless you happen to be a quantum physicist, or find the subject fascinating. 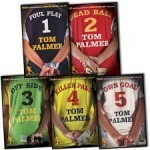 Great puns as well – how can you not want to read ‘foul play‘ or ‘dead ball‘? Or maybe Anthony Horowitz is more their bag? Boy agent saves the world again and again – Alex Rider has also been a movie (it’s rubbish, they’ve crammed in all the plot which means there’s no room for any character development) but it does mean you can do the whole ‘read the book before you watch the movie’ thing. The film was so bad they only made one of them, so again you can talk about why the film didn’t work when the books obviously do. They are for slightly older children though. Humour is another great way to get them reading – there’s a fantastic series of books by Alan Coren called ‘the Arthur westerns’ about a 12 year old boy in the wild west. They’re silly, very funny and aimed at any age – once you know what a cowboy is you could read them. Annoyingly they’re out of print. Really easy to get hold of though, there are always copies at ABE Books (http://www.abebooks.co.uk/) which is a fantastic site for getting hold of almost any book, in or out of print. They’re also short,which is another huge plus. There’s nothing worse than being confronted with a tombstone and an adult saying ‘hang in there, it gets really good’ and so on. Short and funny, both key. Mr Gum, Diary of a wimpy kid, anything by Roald Dahl or David Walliams. All these are designed to get children reading. Lure them in with pictures – I’ve posted elsewhere about graphic novels, I think these are brilliant, and they’re more immediately appealing than a daunting block of text. Audio books are also excellent. We had to go on a really long drive so I went to the library and was lucky enough to get Millions and Framed – both by Frank Cottrell Boyce, both audio books. It was a bit of a revelation, all three kids loved them, obviously there were good actors doing the reading and they are really really funny. They will crop up on other lists I’m sure of it, it just so happens we discovered them first on audio book. Either way, when we got home the older two children both asked if we could get more books by him. We did. 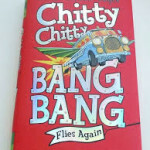 Cosmic is also very very funny, and the children really liked the updates of Chitty Chitty Bang Bang. In fact, it made them go back and read the original again, and then we watched the film, which is really different so it was all good. The other thing which seems really obvious but I still do with mine, is to read to them. Pick a really exciting book and then read them a few chapters at a time. The ideal is that when you stop they are so enjoying the book that they then ask to carry on reading by themselves, or even if they don’t they still get the narrative benefits of reading and hopefully it creates a sort of atmosphere of reading as a fun thing to do. You can also read them slightly more challenging books which are more exciting so they will enjoy them more. Stopping at the most exciting point is a trick that’s been working for years. Dickens did it, so why shouldn’t we? There is a fantastic website called Storynory which is an amazing resource. It publishes a new audio story for children every week, completely free. It’s been going since 2006 so there’s loads of brilliant original stories, myths, legends, fairy tales, poems, international stories, everything. They’re all read by professional actors and the text is printed as well so you can follow the words as you listen to the story. Really good. Get a kindle. Personally I love the feel of a book in my hands and find not being able to ‘feel’ where I am in a book a bit weird, but it definitely gives them a more book as toy feel. They’re immediate, it becomes more like playing a game, and they’re really portable. I’m a magpie so I miss the shiny covers, but that’s just me. Let them read anything. Until they are happily picking things up randomly they don’t need to be selective. Get them reading, there are no ‘bad books’. Last of all, but I admit this probably has limited success, remind them how influential books can be. One of my favourite things to do with children in schools is to read them a bit of Treasure Island. Then you ask/tell them that there have been over 50 tv and film adaptations of it, 25 radio plays, it’s a computer game, there’s a famous five book about it, a muppets film based on it, the Disney film Treasure Planet is based on it, and its been translated into almost every language in the world. Not bad for a book written over 130 years ago.